Allen, Richard (2006): Hitchcock’s Color Designs. In: Angela Dalle Vacche and Brian Price (eds. ): Color. The Film Reader. New York: Routledge, pp. 131–144, on pp. 134–141. Hitchcock also inverts these color associations. Sometimes, men in Hitchcock wear redemptive earth tones such as the brown suit worn by Sam Flusky (Joseph Cotton) in Under Capricorn (1949), when his innocence is apparent. 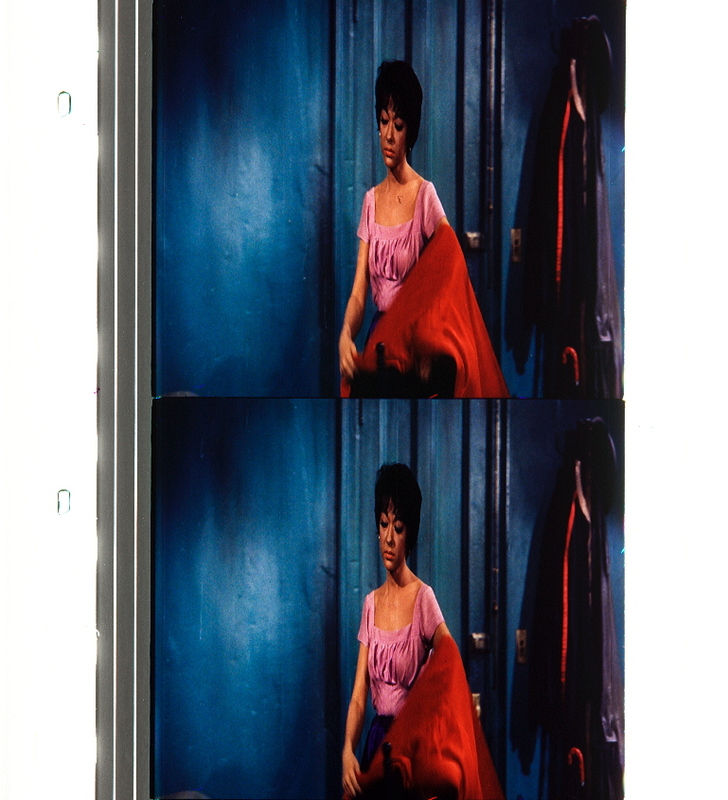 However, the inversion of gendered color alignment is especially significant when women in Hitchcock’s wear work blues and grays and other cool colors. Women wearing cool colors suggest not simply a “masculine” emotional detachment or coldness, but also the sense of an alluring yet dangerous sexuality that lies beneath the cool exterior. […] “Madeline” (Kim Novak) in Vertigo, dressed in a gray tailored suit, epitomizes the persona of the cool blonde in Hitchcock’s work, whose cool exterior harbors an alluring but dangerous sexuality. Furthermore, Madeline’s blue-gray color is explicitly related to death in the form of the grays of the graveyard she stalks when ostensibly possessed by the ghost of Carlotta Valdes. 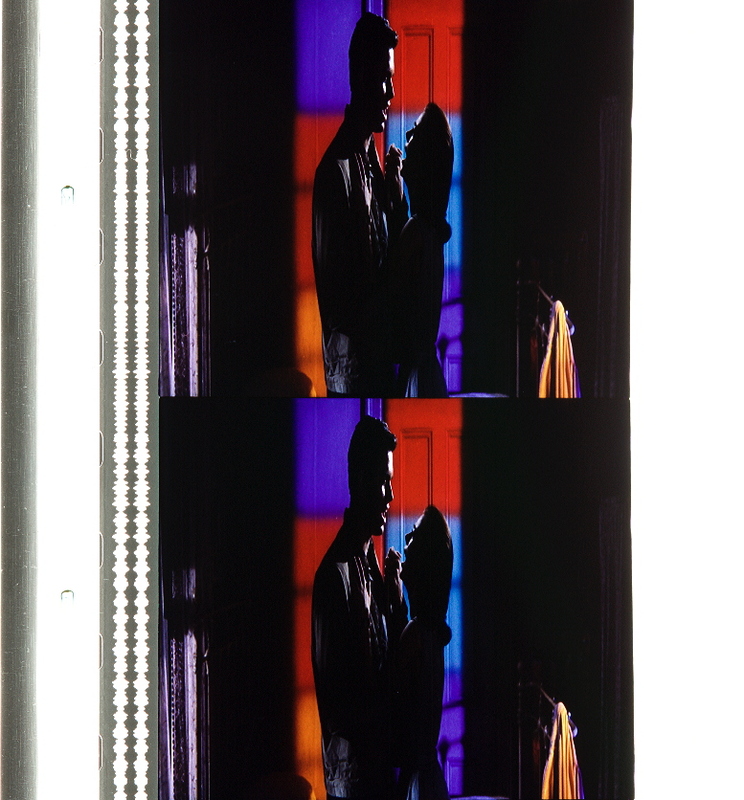 In this way, Vertigo‘s blue-grays help to cast the shadow of perversity upon the representation of sexual desire in the film: The figuration of death and female sexuality as an object of desire are entwined. 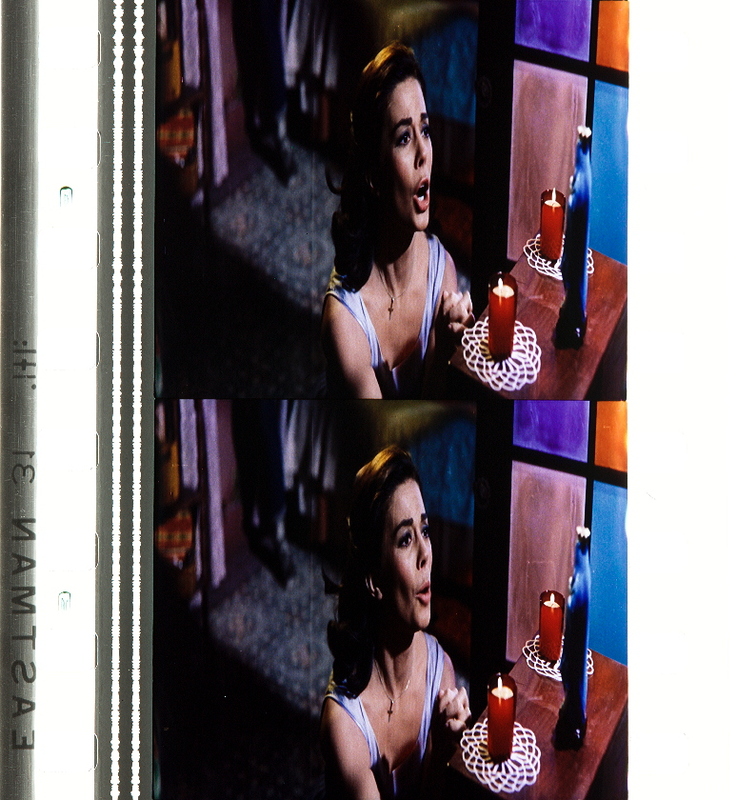 The meaning of earth tones is inverted in a different way in Vertigo where Judy Barton playing Madeleine possessed by a ghost from the past first appears to the eyes of Scottie Ferguson in an elegant black gown swathed with a luminous deep jade shawl edged in black. 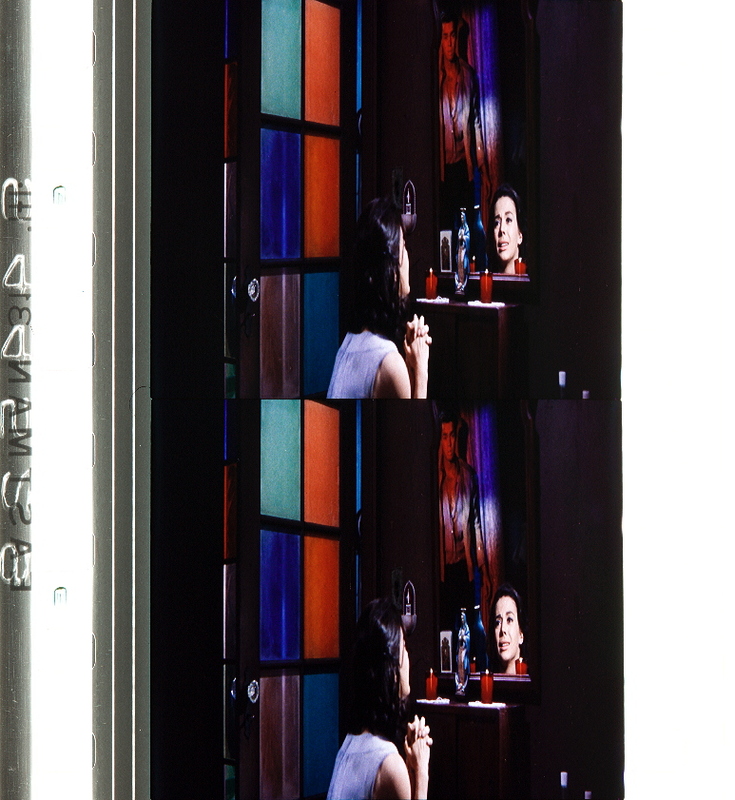 Much later in the film, as Scottie tries to recreate the image of the possessed Madeleine in the body of a women who is, unbeknownst to him, none other than Judy Barton, her image, now recreated as Madeleine, is bathed in the pale jade light emanating from the neon sign outside her seedy hotel. As Scottie embraces this reincarnation of Madeleine, the camera pans around 360 degrees to silhouette their figures against this jade light in a manner that wholly abstracts them from the hotel room they inhabit. Although green, jade is a green that has been crossed with a blue to render it cool and decidedly unlike the earth tones that green customarily evokes. This jade-green light was derived from the London stage of his youth; “I remember the green light – green for the appearances of ghosts and villains” (Hitchcock quoted in Spoto 1983: 212). Perhaps pale jade is associated with ghostliness because it is close to the color of mold and hence evokes the presence of death. 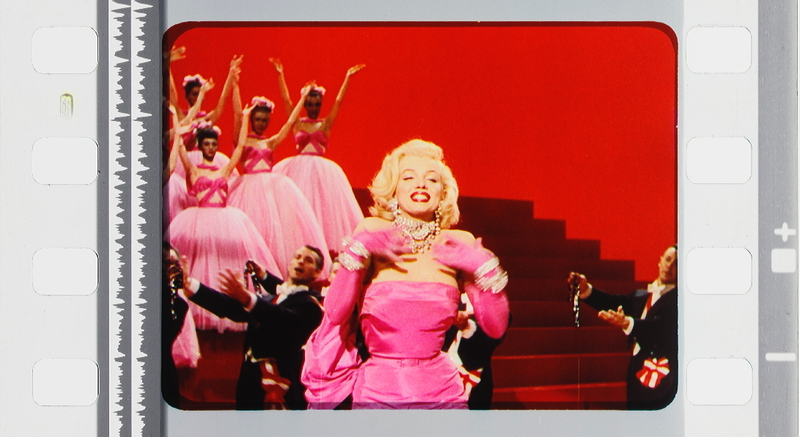 This color is used consistently throughout Hitchcock’s work: In the neon sign in Rope that bathes the apartment of the killers; in the ghostly hue of the night sky in To Catch a Thief, and in the pasty face of Milly (Margaret Leighton), the sinister housemaid in Under Capricorn, as she tries to poison the heroine. Over and above the role that red, and in particular red against white, plays in signaling danger, red on white is a pervasive index of the threat posed by female sexuality in Hitchcock’s films. Here, too, Hitchcock draws upon deep-rooted cultural associations and iconography that link whiteness to feminine purity and virginity and red to menstrual blood and thence to the threatening dimension of female sexuality. I have already noted the manner in which cool colors in Vertigo convey a relationship between female sexuality and death, and this association is further cemented through the evocation and role of the color red that links female sexuality and danger. Scottie Ferguson first sets eyes on Madeleine wearing her black dress and jade satin shawl in the glorious saturated red surroundings of Ernie’s restaurant bedecked with red and white flowers. The posy carried by Judy playing Madeleine possessed by Carlotta consists of red rosebuds and bluish greenery against the background of a white doily. Scottie observes the same posy in a painting of Carlotta looked at by Madeleine, where it evokes the idea of female sexuality. Carlotta also wears a ruby necklace that, later in the film, Judy Barton will wear in a manner that will expose to Scottie the fact that she was really acting the part of Madeleine possessed by Carlotta in order to trick him. In Scottie’s apartment, after he has rescued Madeline from San Francisco Bay, Madeline wears a red robe, with a hint of redemptive white in the spots that cover it, that suggests at once her threat and her desire to reciprocate his tenderness. In his use of the color red in Vertigo and Marnie to represent the link between sexuality and death, Hitchcock explores the edges of a surrealist aesthetic that he had earlier dipped into through his collaboration with Salvador Dali on the dream scenes in Spellbound (1945). […] The image suggests in the manner of surrealism that the true reality is a world of fantasy sustained by sexual desire that the world of surface appearances and decorum conceals. For Scottie in Vertigo, the ghostlike incarnation of Madeleine that conforms to his fantasy is more real to him than the world of the ordinary represented by his friend Midge and their failed relationship, and in Marnie the everyday world is flat and colorless in comparison to suffusions of red that overwhelm it. When Judy Barton as Madeleine leads Scottie Ferguson to the bell tower in Vertigo, she wears a wool speckled black-and-white coat. The mingling of black and white here suggests the blurring of moral boundaries, as in the expression that something is not black and white. Keating, Patrick (2010): Hollywood Lighting from the Silent Era to Film Noir. Columbia University Press: New York, on p. 217. “Becky Sharp provides a well-known example. 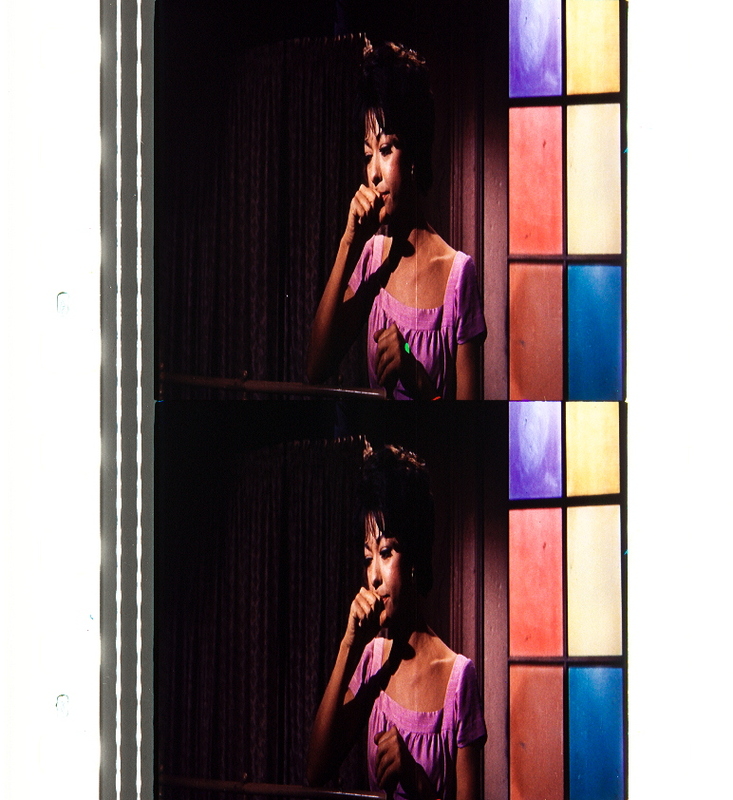 After a series of scenes with relatively restrained color, the film shifts to a much bolder palette during the Waterloo sequence. Characters rush across the screen in primary colors, such as blue and red, while a low-placed light casts their shadows on a background wall. The tension between dramatic emphasis and pictorial display is very strong in this scene. The director, Rouben Mamoulian, claimed that dramatic emphasis was his first priority. He even boasted, “You will see how inconspicuously, but with telling effect, the sequence builds to a climax through a series of intercut shots which progress from the coolness and sobriety of colors like gray, blue, green, and pale yellow, to the exciting danger and threat of deep orange and flaming red.”25 However, the scene leaves no lasting impression as the film’s narrative climax; rather, it is best remembered as a circus of visual spectacle, putting Technicolor’s palette on vibrant display. Allen, Richard (2006): Hitchcock’s Color Designs. In: Angela Dalle Vacche and Brian Price (eds. ): Color. The Film Reader. New York: Routledge, pp. 131–144, on pp. 132–137. Allen, Richard (2006): Hitchcock’s Color Designs. In: Angela Dalle Vacche and Brian Price (eds. ): Color. The Film Reader. New York: Routledge, pp. 131–144, on pp. 141–143. My approach in this essay has been to discriminate the color patterns that exist across the entire range of Hitchcock’s work. I have discriminated four main color systems: Color versus colorlessness, cool colors versus warm colors, black versus white, and the “warning series.” These patterns of color meanings are unique to Hitchcock’s work, but in Hitchcock’s hands they become particularly articulate because of Hitchcock’s obsessive attention to the organization of the visual content of his images. I have also suggested how the meaning of color in Hitchcock’s work can only be understood in terms of the relationship between the conventional cultural meanings attached to color and the particular way that color patterns and meanings are deployed in specific films where Hitchcock’s intention is often to subvert received meanings. However, I have only touched upon the complexity of color meanings in individual films: There is no substitute for the detailed investigation of color in the context of the critical interpretation of individual works. Allen, Richard (2006): Hitchcock’s Color Designs. In: Angela Dalle Vacche and Brian Price (eds. ): Color. The Film Reader. New York: Routledge, pp. 131–144, on pp. 135–142. “In The Birds, the Brenner household, in particular the family living room, is a space denuded of color and lit by black lampshades (in a living room! ), articulating the sense of emotional desiccation and emptiness that is attached to the character of Lydia Brenner after the death of her husband. The Birds provides a good example of the systematic way in which Hitchcock uses the warning series where its central use is keyed to the anticipation and arrival of the birds. When Melanie Daniels drives through the town of Bodega Bay, having been “sent off” by the intimidating figure of Annie Hayworth (Suzanne Pleshette) perched in red by her red mailbox she is framed portentously by the yellow sign of Bodega Bay in the background and a red stop sign in the foreground. Other red signs adorn the colorless sidings of the stores and the windows of Tides Restaurant where Melanie repairs with Mitch Brenner (Rod Taylor) after the first bird attack has caused her to bleed, are framed in red against the white siding. In the birds’ first massed attack at Cathy’s birthday party, red, orange, and yellow balloons festoon the house (together with white and blue) that the birds pop in their attacks. They stand out against the white siding which also serves to register Hitchcock’s //// motif. In the birds’ second attack, the schoolchildren are singled out as targets in their red and yellow against blue and white clothing. In the third attack at the Bodega Bay gas station, the gas station is itself arrayed in black and white and is then ignited by a yellow line of flame. From a literal bird’s eye view, the conflagration suggests a target area in the way it is framed by the red tiled roofs against white buildings. 6 I explore the color scheme of The Birds in detail in Allen 1997–8. 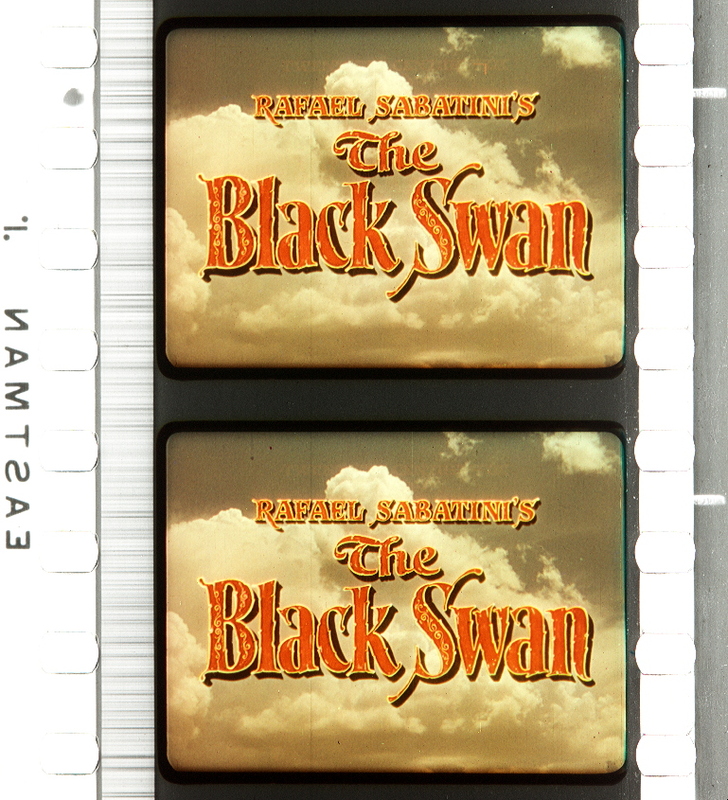 The Black Swan (USA 1942, Henry King). Credit: UCLA Film & Television Archive. 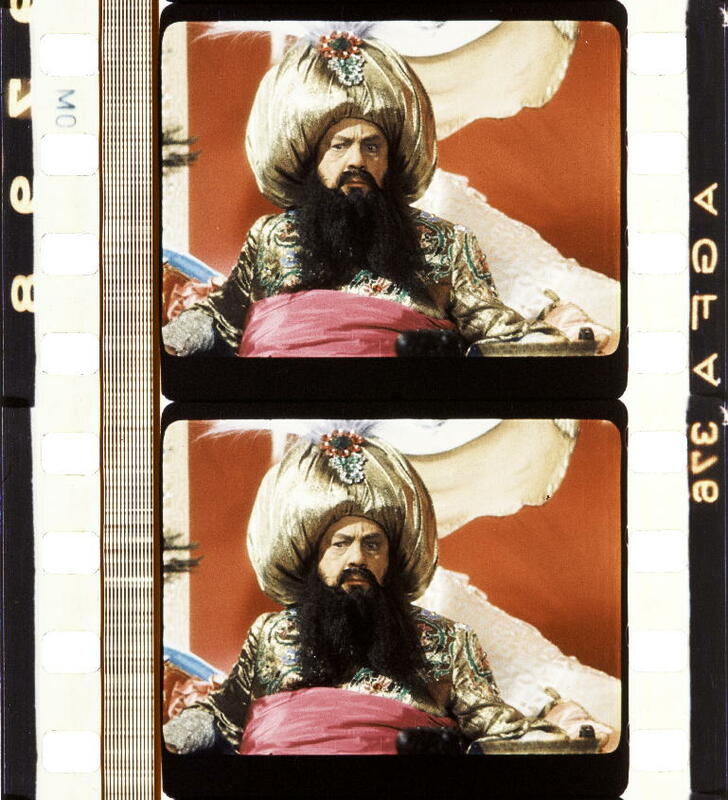 Photographs of the Technicolor dye-transfer nitrate print by Barbara Flueckiger. Münchhausen (Josef von Báky, Germany 1943). Credit: Bundesarchiv Filmarchiv and Friedrich-Wilhelm-Murnau-Stiftung. 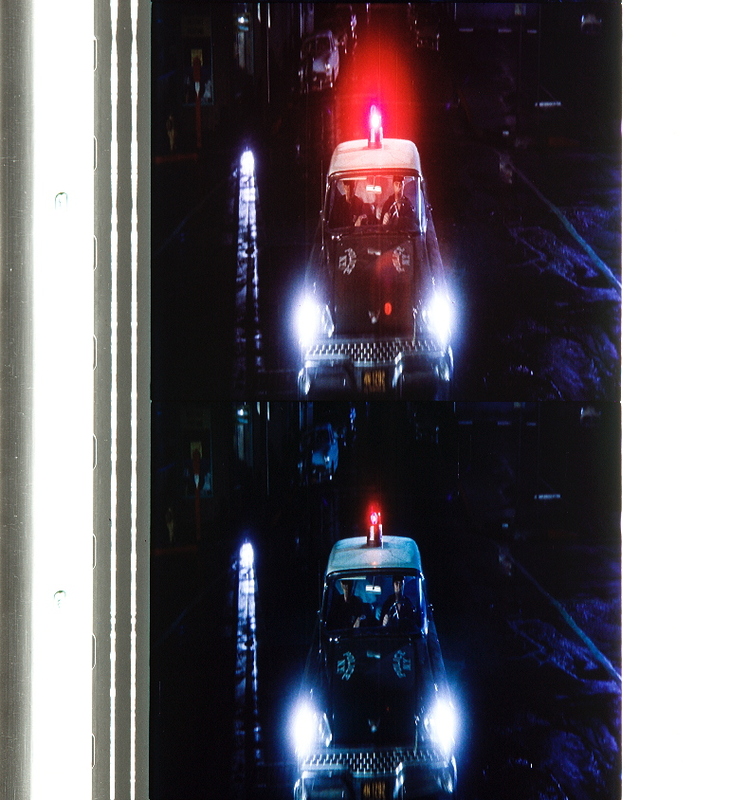 Photographs of the Agfacolor safety print (acetate) by Barbara Flueckiger. “In another Cold War film, Torn Curtain, the opposition of colorfulness and colorlessness is orchestrated across the entire film in a manner that is carefully cued in the opening sequence. Torn Curtain begins with a group of international scientists meeting on a freezing cold cruise ship off Copenhagen. The ship is white, the sea is gray, and an interior scene introducing the scientists dining in winter coats with their knifes and forks clanking coldly on their plates is depicted in black, white, and grays. The overall effect of uniformity is underscored by close-ups of the scientists’ name tags on nearly identical black-and-white check jackets. When an East German agent enters the dining room to look for the protagonists, Hitchcock shoots the reflection of the diners behind his head in black and white, emphasizing the dullness of the place. Hitchcock then cuts to a couple, the protagonists of the film, Sarah Sherman (Julie Andrews) and Michael Armstrong (Paul Newman) making love in bed. A red, yellow, blue, and green check blanket is thrown over a gray one articulating the literal and emotional warmth that is evident in the scene in a manner that temporarily blots out the surrounding coldness of the Cold War environment. The grays of Torn Curtain in this respect condense the cool colors of North by Northwest into the dull grayness of a colorless fallen world. Sherman follows Armstrong to East Berlin where she suspects him of being a defector until she discovers that he is working for the Americans. East Germany is portrayed as colorless. Metallic grays associated with a coldly rational and emotionally deadening communist regime and images of urban gray modernity are juxtaposed with the gray bombed-out corpses of buildings in a manner that evokes the wider connotations in the film that link the gray modernity behind the Iron Curtain to death or to a state of limbo between life and death. “When we did Torn Curtain,” Hitchcock states, “we set up a rule: the moment we got into East Germany we’d go to gray and beige tones only.” Hitchcock shot the scenes through a gray gauze in order to “reduce the risk of color taking over too much” (Hitchcock 1995: 306). The color of Sarah’s clothes, green and brown, provides an oasis of warmth and security amidst this gray desert. When Michael finally communicates his true motives and erases Sarah’s doubts about him, the couple retreat to a hilltop, a nature world of browns and leafy greens rendered artificial in the denatured environment behind the Iron Curtain. In contrast to cool colors, warm colors, or earth tones such as tan, brown and forest green are widely associated with a sense of emotional warmth and the redemptive qualities of the nature world that are linked to the idea of femininity in Western culture through the figure of Persephone, goddess of Spring, and Eve in the Garden of Eden. Earth tones in Hitchcock’s films signify both redemptive femininity and redemptive nature that provides safe haven and emotional sustenance. […] The redemptive role of Sarah Sherman in Torn Curtain is defined not simply by her association with color but by the fact that she wears earth tones, and her green dress is keyed into the one or two trees that grow in the desolate gray landscape of East Germany. The female contact Armstrong meets from the Pi spy organization lives in a rustic brown farmhouse and wears a floral dress of warm earth tones. The field behind the house where Armstrong meets an American agent appears in a long shot as a green oasis in a colorless, desolate landscape. The nature world where Sherman and Armstrong finally reconcile is an oasis of earth tones within a desolate urban gray. The “warning series” consists of bright, saturated, and solid yellow, orange, and red either individually or in sequence or combined in the same image to indicate progressively greater degrees of danger. 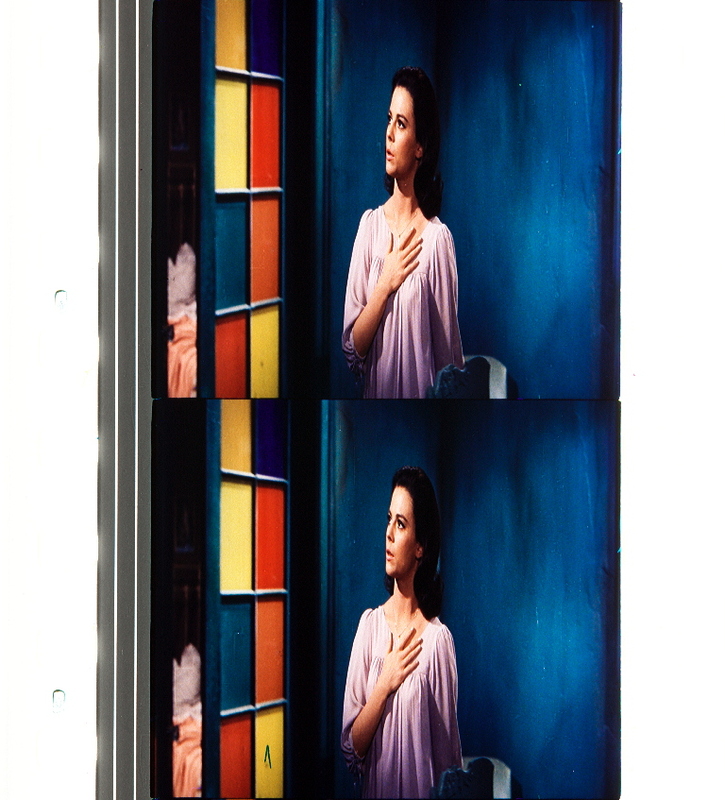 Often Hitchcock’s use of these colors, especially red, is highlighted in the image via a contrast with white and sometimes blue. By using hot colors to convey caution or danger, Hitchcock is obviously drawing upon deeply embedded cultural associations that draw on the relationship between red and blood and yellow and red and fire. 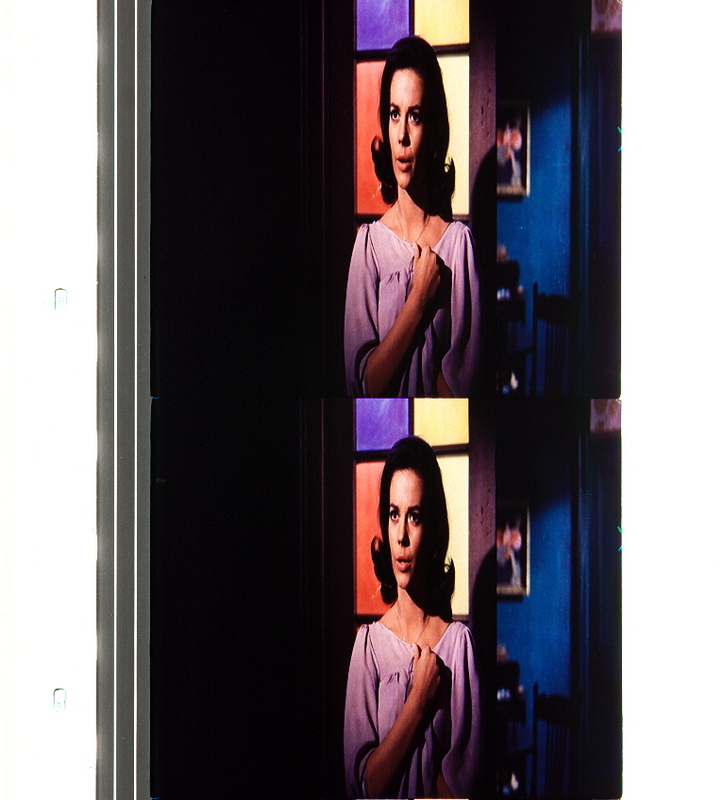 The basic significance of this color patterning is to create warning or danger posed within the world of the film to the central protagonist, and its use in this respect is a ubiquitous feature of Hitchcock’s color design. 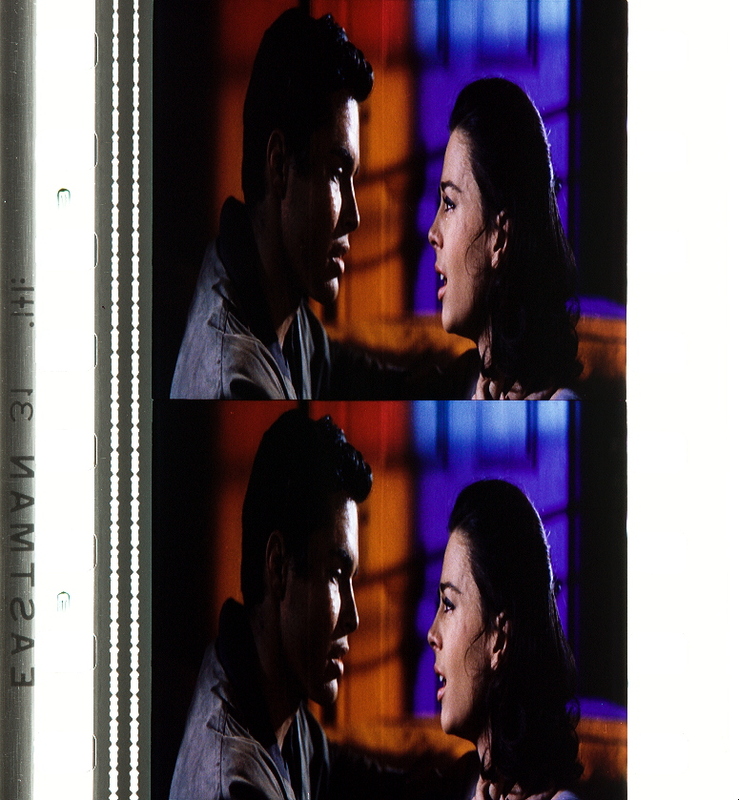 The close of Torn Curtain makes a knowing reference to the colors of warning as Sarah and Michel, desperate to escape from East Germany, are trapped in an opera house. Michel looks at the yellow and red fire blazing at the center of the ballet set, which is an index of the danger they are in, and responds to this warning with the cry of “Fire!” thereby effecting a means of escape. The use of red against white (and the warning series as a whole) is an index of the shadow world in Hitchcock, the life-threatening world that subtends the apparently benign world of appearances, here, an audience enjoying an opera. In this respect, red in Hitchcock’s color films assumes the role of the //// design that, as William Rothman demonstrates, pervades Hitchcock’s black-and-white films (Rothman 1982: 33). Indeed, in the color films, the warning colors often accompany the //// design, for example, the flames from the fire in Torn Curtain are abstractly rendered as a parallel series of red, pink, and white wavy lines against a red background. Hitchcock draws on a range of cultural associations attached to the opposition between black and white. The opposition between black and white signifies morality via its association between light and darkness: Black suggests villainy and white suggests goodness. Two memorable Hitchcock male villains appear dressed in black: Gromek (Wolfgang Kieling) in Torn Curtain and Arthur Adamson (William Devane) in Family Plot.